My latest piece of video production equipment is a drone which is also known as a UAV (Unmanned Aerial Vehicle) or a UAS (Unmanned Aerial System). To fly a drone commercially requires much more behind-the-scenes than you might think. Especially if it weighs more than a kilogram. You need to have training which includes safety protocals, aviation weather knowledge, knowledge of Transport Canada aviation regulations, Restricted Operators License - Aeronautical for a radio and more. You need a medical form from a doctor, a visual observer to be with you to help maintain security of the operation area and watch for hazards including other aircraft. You need to apply for a Special Flight Operations Certificate (SFOC) from Transport Canada which (at this point in time) requires an application for every commercial flight. These applications take as many as 22 business days to get approved. You must have maintenance procedures in place and documented as well as a current flight log. It's a lot of work but the opportunities and footage that can be obtained are pretty cool. 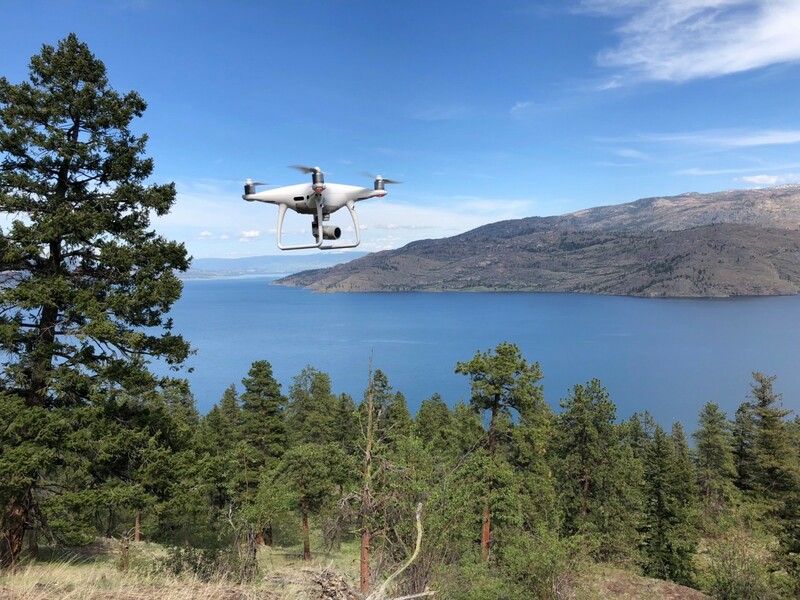 The places I can train and recreationally fly my drone in Kelowna are very limited. Most of Kelowna falls within Class D airspace as seen in the picture above so when learning to fly a drone I needed to venture off into the boonies. The Regional District of The Central Okanagan's Parks and all of the City of Kelowna's and West Kelowna's parks are no fly zones without permission. As of late I've been getting out as much as possible to practice flying and train the visual observers I'll be working with. In the opening shot of the video below I'm using an advanced feature involving waypoints. I can pre-fly the route and set waypoints with camera direction and hazards in mind. Upon completion the controller uploads the waypoints to the drone and it flies the route perfectly smoothly then hovers at the end of the route. Pretty cool.